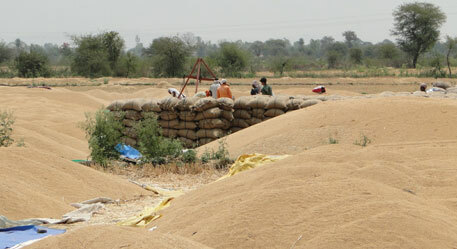 INDIA’S ability to continue procurement of foodgrains at the minimum support price (MSP) from low-income farmers will be decided at the 9th ministerial conference of the World Trade Organization (WTO) opening in Bali on December 3 when once again, developing countries are attempting to set right WTO’s lopsided Agreement on Agriculture (AoA). If some compromise is not worked out with the developed world, specifically the US and the European UnionÃ”Ã‡Ãª(EU), India’s National Food Security Act (NFSA), passed in September, could be severely constrained by current rules that impose stiff conditions on agriculture subsidies. The most contentious item on the table at Bali negotiations is the proposal of G-33 nations—this is a coalition of developing countries pressing for flexibility for developing countries in agriculture—on food stockholding for food securityÃ”Ã‡Ãªthat was submitted in November 2012. India is the prime mover of the proposal which seeks a change in WTO provisions on what constitutes a trade-distorting agriculture subsidy. Developed countries are unhappy with the provisions that would allow developing countries to buy foodgrains at prices set or administered by government without having to count it as trade-distorting support. They argue that such a measure would amount to price support for producers, which is subject to limits, and, therefore, becomes trade-distorting. If the grains were bought at market prices, the programmes would not be considered trade-distorting. Indian officials counter that this is a narrow view of the problem which ignores theÃ”Ã‡Ãªrealities of the agricultural scenario. India supports 17 per cent of the world’s population and its farmers are among the poorest, points out Sudanshu Pandey, joint secretary in the Ministry of Commerce. While per capita landholding in the EU, US and Canada have almost doubled, in India it has declined to 0.13 hectare of arable land. Besides, it is largely rain-fed agriculture. “We have to take on board the concerns of our farmers who are extremely resource poor. In India, the issue is not just about food stockpile for food security but also about supporting low-income farmers,” Pandey says. He insists that NFSA has nothing to do with the Bali negotiations. “This is purely a domestic issue. If we can comply with WTO provisions there is no problem.” But there is, indeed, a huge problem with WTO’s provision on subsidies which are heavily tilted to favour rich nations. Experts point out WTO’s 1994 AoA stems from the Blair House agreement of 1993 that was cobbled together by the US and the EU in order to shield their phenomenal farm subsidies from any dispute at WTO. This has allowed the two largest trading blocs in the world to provide huge subsidies to their farmers without inviting penalties (see ‘How the US and Europe hide theirÃ”Ã‡Ãªfarm subsidies’). In WTO parlance, farm subsidies are categorised in three boxes: amber (calculated as AMS or aggregate measurement of support) which is subject to limits and invites penalties if exceeded; green, which is protected from legal challenge, and blue which has no limits. Rajiv Kher, additional secretary in the Ministry of Commerce and India’s chief negotiator at the WTO, says the G-33 proposal is justified since it serves a dual purpose of helping resource-poor farmers and providing food security to the poor, whereas the US and the EU continue to give out billions in farm subsidies that they had committed to do away with in the Doha round. These two have been gradually shifting their subsidies from the amber to green box where they are sheltered from any challenge. 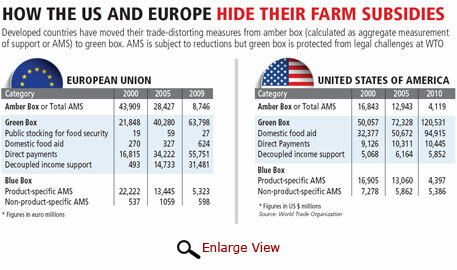 The EU, for instance, has slashed its AMS or amber box subsidies from €50 billion in 1995 to €8.7 billion in 2009, while its green box subsidies have shot up from €18.7 billion in 1995 to a whopping €83 billion in 2012, accounting for 19 per cent of total farm revenues. As for the US, its green box payouts have increased from $46 billion in 1995 to $120.5 billion in 2010. A huge component of this is its domestic aid programme which has soared to almost $95 billion whereas India’s MSP and those of other developing countries are subjected to the strict de minimis limit. The G–33 argues that the illogical way trade-distorting domestic subsidy is calculated means that several developing countries are in danger of reaching or exceeding their permitted limits. How much a government actually spends is not the criterion but what matters is how much higher the government’s current administered prices are based on ERP of 1986-88. No allowance is made for inflation or rise in commodity prices. A telling example is what India’s procurement entails under the WTO system. The ERP notified by India is Rs 3.52 per kg while the current year’s MSP is Rs 19.65 per kg. This means the subsidy will be an untenable figure of over Rs 16 per kg. That the system is intrinsically flawed and outdated is unlikely to cut any ice with the rich nations at Bali. The US has been adamant that its focus, like that of other developed nations, is on anÃ”Ã‡Ãªexpensive trade facilitation agreement at Bali, aimed at expediting the movement and clearance of goods without hurdles at entry points. Although the draft proposals have several hundred square brackets (unresolved issues on which there is no agreement), US Trade Representative Michael Froman has warned that if there is no strong, binding trade facilitation agreement it would spell doom for WTO. The US contention is that trade facilitation will deliver the most benefits for developing countries by reducing costs of trade for them by as much as 14 per cent. But it is an expensive proposition and there is no mention of who will be picking up the tab for these measures. Developing countriesÃ”Ã‡Ãªin any case believe it is the rich world that has more to gain, although Froman says it’s the other way round. Kher, in fact, has been categorical that India will not agree to this unless there is a quid pro quo on the G-33 proposal. He told an industry consultation organised by the Confederation of Indian Industries in July that if the proposal on food stockholding does not move forward, the trade facilitation agreement will not happen either. For India, this will mean severe constraints in implementing the NFSA. According to one calculation, India’s use of MSP this year would be limited to 10 million tonnes, whereas its requirement for procurement is being projected at around 34 million tonnes. This is why we should never have joined the WTO/GATT. It puts the principles of profit over the genuine needs of people.